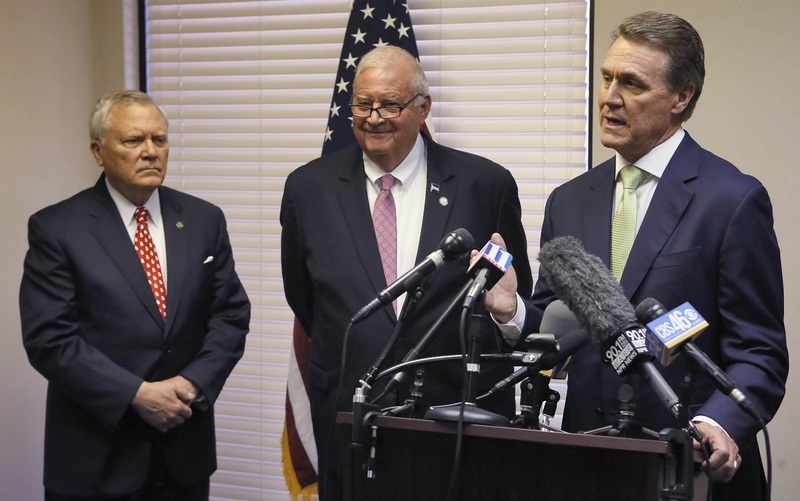 By April Hunt on Tuesday, November 11th, 2014 at 1:18 p.m.
Senator-elect David Perdue (right) reacts to a question during a press conference with Gov. Nathan Deal (left) and Georgia GOP Chairman John Padgett. Photo by Bob Andres/ AJC. Tuesday is Veterans Day, and in light of last week’s election, PolitiFact Georgia is taking a look at what veterans and others can expect from politicians and policy makers in the coming term. Close to home, Gov. Nathan Deal has said his second-term agenda will include new proposals to his ongoing criminal justice reform effort. Among his plans: setting up more veterans courts for service members, like the one that already exists in Fulton County. Such "accountability courts" allow specific offenders charged with less serious and nonviolent crimes to admit to their crimes and receive treatment, not punishment. Services include counseling and connections to federal and state resources and can also involve specialized treatment, such as care for post-traumatic stress disorder. On the national level, when Senator-elect David Perdue is sworn into office in January, he will joins Republican majority in both the U.S. Senate and House of Representatives. While Perdue has said his priorities will be tax reform, such as reducing the repatriation tax on corporate overseas profits, and authorizing the Keystone XL pipeline to pump oil from Canada into the U.S. But Perdue is also expected to go along with soon-to-be Senate Majority Leader Mitch McConnell to approve the the Hire More Heroes Act in a bid to spur more former service members into jobs. The federal health care law requires businesses with 50 or more employees to provide health insurance. Veterans hired under the Hire More Heroes Act would not count toward that threshold, as long as they already have health insurance coverage elsewhere.